The Muographers were invited to a special Keynote session of the 2016 Science Agora festival held in Odaiba, Tokyo, an entertainment district of Tokyo, situated on a man made island in Tokyo Bay overlooking the Tokyo skyline. Odaiba was built up considerably during the 1980’s and 1990’s during the bubble economy and features many distinctly high tech, futuristic architecture from the 1990’s including Fuji TV Building and Panasonic’s Big Sight Area. 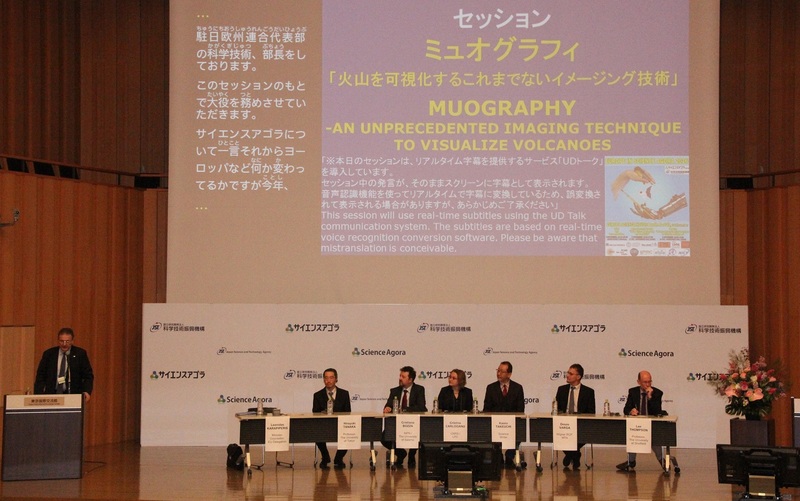 In conjunction with the Muographers 2016 conference which was held at Europa House, the European Delegation to Japan headquarters, the Muographers contributed to the Agora Session on muography. Leonidas Karapiperis – Minister-Counsellor and Head of the Science and Technology Section of the European delegation to Japan. They gave presentations of their work after which was a panel discussion and Q and A session. The discussion was conducted in English with Japanese translation available to the audience.